Pure water has both a freezing point and melting point of 0˚C; however water also has colligative properties meaning that the freezing point can vary depending on the number of molecules dissolved in it. As the concentration of molecules increases, the freezing point decreases (and the boiling point increases). For example, pure water will have a higher freezing point than salt water. This is because the presence of dissolved molecules in the water makes the formation of hydrogen bonds less energetically favourable, such as those formed by ice crystals. The change in freezing point is known as freezing point depression. Therefore the freezing point of seawater is -1.86˚C, which is lower than pure water due to the dissolved NaCl molecules. The formation of ice crystals usually requires a form of ‘catalyst’ known as an ice nucleating agent (INA). The presence of an INA allows water molecules to begin forming an ice crystal around it. Such agents include; dust, bacteria, proteins or already present ice crystals. Without the presence of an INA, much lower temperatures can be reached before freezing occurs, this is known as supercooling. Supercooling is a process where liquids can reach very low temperatures before rapid freezing occurs, this is because there are no ice nucleating agents (INAs) present. Without an INA present, water molecules struggle to begin forming ice crystal and hence the fluid stays in liquid form. For example, a beaker of non-distilled water is cooled slowly and freezes at around 0˚C. Another beaker of pure water is cooled and care is taken to remove all INAs. This requires using pure H20 and a clean, sterilised glass free from dust and impurities etc. The experiment must also be carried out in a clean atmosphere or the beaker must be covered to prevent INAs such as dust entering. If no INAs are present, then the beaker of water can be cooled past 0˚C, it is possible to reach -40˚C before spontaneous rapid freezing occurs. The point at which a liquid will freeze in the absence of INAs is known as its super cooling point. Even though the 2nd beaker of water froze at -40˚C, its freezing point is still 0˚C, this means that spontaneous freezing can occur anywhere between 0 to -40˚C. Freezing post-freeze point can often be induced by disturbing the liquid i.e. tapping the glass. Physical damage, for example, the formation of ice crystals which could pierce and burst the lining of small capillaries. Freezing can lower the rate of blood flow (ischemia), which would reduce the rate at which tissues receive oxygen and nutrients. This in turn could lead to anoxia. Freezing may also cause osmotic shock, this can lead to collapse of the cell membrane, swelling or bursting of the cell. To survive at freezing temperatures, organisms must combat the freezing process. Mammals and birds are endothermic, thermoregulators and thus produce their heat to stay warm. Thermoconformers, i.e. ectothermic organisms such as invertebrates and lower vertebrates, do not produce their own heat and must avoid freezing by other means. The body temperature of thermoconformers (Tb) is equal to the environment temperature (Ta) i.e. Tb=Ta. Problems generally occur when Ta < 0oC. For example, freshwater fish have a body fluid freezing point of around -0.6oC. The freezing point of freshwater is around 0oC. Because the environment freezing point is higher than that of the body fluids it is unlikely the fish will be harmed by freezing. However marine fish (still with a freezing point of around -0.6oC) face a bigger threat. This is due to the freezing point of seawater being lower, at around -1.38oC (due to a higher osmolarity as discussed earlier). This means the marine fish can freeze before their environment; therefore they must adapt different survival strategies. To survive freezing conditions there are two options; freeze tolerance and freeze avoidance. Tolerance requires that the organism’s body learns to cope with the freezing process, whereas avoidance employs certain strategies to avoid freezing altogether. These strategies include, super cooling and freeze point depression. Supercooling is widespread amongst arthropods; it involves the voidance of all ice nucleating agents from the body, thus allowing body tissue to supercool. An example of how this is achieved in insects is the emptying of the gastrointestinal tract. This prevents ice nucleating agents from entering the body. By entering hibernation at the same time it is possible to prevent the disturbance of bodily fluid and thus reduce the risk of freezing. Electrolytes, such as salts and ions, however these can be damaging to the body at high concentrations as they can disrupt membrane potentials and proteins. The other candidates are low mass organic solutes such as short chain sugars and alcohols; these have the benefit of not being harmful to the body at the concentrations required for freeze protection. The typical molecule used for colligative defence is glycerol; such use has been demonstrated in Alaskozetes antarcticus, a species of mite which is able to survive in freezing temperatures. During the winter A. antarcticus cellular concentrations of glycerol are around 7 times higher than in summer. This rise in concentration of glycerol causes ΔFp (the change in freeze point depression) to fall drastically. A 5M concentration of glycerol means a ΔFp of -9.3oC allowing survival at much lower temperatures. A fall in freezing point also means a fall in super cooling point too; a 5M concentration of glycerol will lead to a super cooling point of around -55oC. An alternative to the typical colligative defence is the use of non-colligative proteins which work in a different manner to prevent the formation of ice crystals. The proteins responsible for this are known as antifreeze proteins (AFPs) and antifreeze glycoproteins (AFGPs). AF(G)Ps work by lowering the temperature at which ice crystals can grow, thus reducing the freeze point of body fluids. However they do not alter the melting point, a concept known as thermal hysteresis. This means that the inclusion of AFPs in the blood will lower the freezing point to around -2.0oC, but the melting point of the blood will not change, staying at around -0.9oC. Under normal circumstances, the freeze point (Fp) is equal to the melting point (Mp). Colligative defence mechanisms decrease both Fp and Mp, but non-colligative defences, via AFPs, reduce the Fp leaving the Mp constant. AFPs also differ from colligative defences in another manner. With colligative defence, the freeze point changes in a linear relationship to the osmolarity of the colligative molecule. However AFPs depress the freeze point greater than expected. They reduce the freeze point to the maximum possible at concentrations which would barely see a reduction in freeze point by typical colligative molecules. AFPs inhibit recrystalisation, that is, they prevent smaller ice crystals joining together to form large ice crystal lattices. They do this by attaching to the, typically flat, growing planes of the ice crystal. By doing this, they cause highly curved fronts to form in the ice crystal. This disrupts the structure and prevents further water molecules adding to the lattice as doing so would require much larger amounts of energy than normal. This is known as the adsorption-inhibition model. The production of AFPs may exhibit seasonality, for example, polar fish of the Antarctic (where there is a continuous ice sheet all year round) continuously produce AFPs. However polar fish of the Arctic (where seasonality is observed) only produce AFPs in the winter when they are at most risk of internal freezing. By doing this, they are able to conserve energy for the winter period (as the production of AFPs is energetically expensive). The seasonal production of AFPs is controlled by the photoperiod (i.e. the day length). A long daylength stimulates the hypothalamus to produce GHRH (growth hormone regulation hormone) which in turn stimulates the pituitary gland to produce growth hormone (GH). Receptors in the liver for GH are activated by GH and induce a signal within liver cells. This signal inhibits the transcription of the AFP gene and thus no AFP mRNA is transcribed and no AFPs produced. During shorter photoperiods (i.e. winter) instead of GHRH, the hypothalamus produces somatostatin (also known as growth hormone inhibiting hormone GHIH). This prevents the secretion of GH by the pituitary gland and thus liver cell GH receptors produce no signal. The AFP gene is not inhibited, produces mRNA and mature AFPs are produced and exported in to the blood. Some organisms choose to cope with freezing by a different means, instead of trying to prevent freezing they actually induce freezing at ‘high’ temperatures so they are able to cope. This is widespread amongst insects as well as some intertidal invertebrates (e.g. barnacles), amphibia (e.g. green tree frog) and reptilia (e.g. garter snake). Their method of coping with freezing is to control the formation of ice crystal (and thus physical damage). This allows them to freeze slowly and avoid super cooling (which would cause rapid freezing). They initiate freezing at higher than usual temperatures by not allowing body fluid temperatures to fall below freezing; they do this by ‘innoculative freezing’, a process where ice nucleating agents (INAs) are actively taken up from the environment. This prevents super cooling from occurring. However, freezing must only occur extracellularly, even freeze tolerant organisms cannot survive intracellular freezing. An example of innoculative freezing is observed in the wood frog, this species of frog actively internalises ice crystals from its environment to act as INAs. It does this by pressing its body against ice which allows the thin membrane of the under belly to be penetrated by ice crystals. Another example is the crane fly, which instead of taking INAs from the environment, has its own protein ice nucleators which allow initiation of freezing at higher temperatures. As discussed earlier, with osmotic shock, the formation of extracellular ice crystals causes the extracellular osmolarity to increase. The intracellular concentration equilibrates and, as a result of increased osmolarity, freeze point depression occurs. 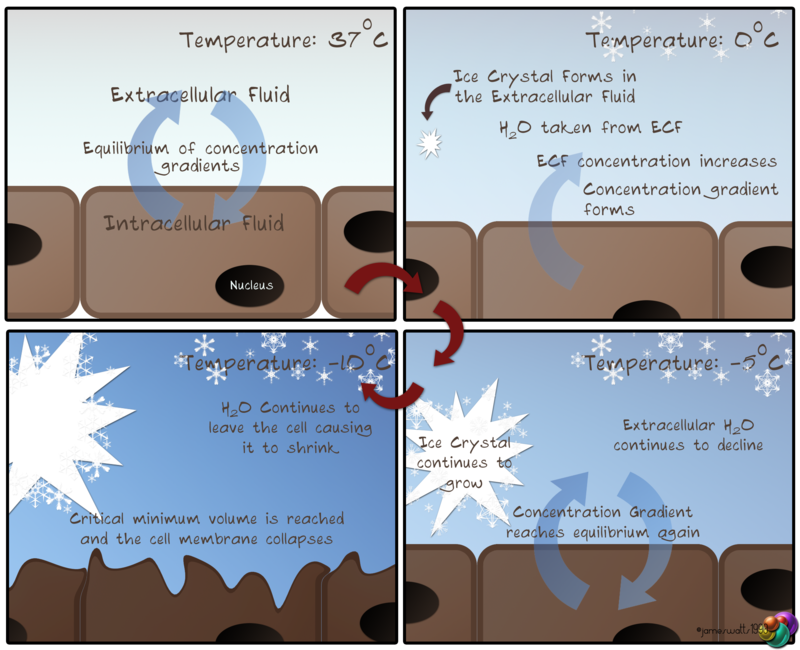 Normally this cycle of increased extracellular osmolarity and equilibration of the intracellular osmolarity would cause the cell to shrink to its critical minimal volume and rupture; however freeze tolerant organisms have developed ways to deal with these major changes in cell volume and osmolarity. Colligative – Colligative cryoprotectants require higher concentrations than non-colligative to function well. They work by accumulating in the intra- and extracellular fluids and limiting the amount of water transfer between them. Non-colligative – Required in lower concentrations, non-colligative cryoprotectants work by binding to the cell membrane. Typically, as the cell osmolarity increases due to freezing, the cell membrane becomes more rigid as the phospholipids of the move closer together. Non-colligative cryoprotectants bind to the phospholipids of the cell membrane and prevent them from moving close enough to form a rigid structure, thus keeping the cell membrane as fluid as possible and preventing cell collapse. The most common cryoprotectants are sugars and polyols (alcohols), they have the benefits of being non-toxic, highly soluble and metabolically inert. Often, multiple cryoprotectants are used, as opposed to relying on just one form. Examples of typical cryoprotectants are; glycerol, trehalose and sorbitol. Cryoprotectants are synthesised from glycogen which means that to survive long, cold winters, the organisms must have large glycogen stores in the liver and fatty tissues. Two other considerations for survival are how to deal with the anoxic conditions endured during freezing and coping with the reactive oxygen species which occur during the thawing process. The way in which the wood frog copes with freezing is to control ice formation in a manner that is slow and occurs from the periphery to the core. Freezing of the peripheral extremities causes signals to be sent to the liver to begin producing cryoprotectants. The glycogen stores begin to be broken down into glucose which acts as a cryoprotectant for the wood frog. This is where the large fluid filled spaces are advantageous – when freezing begins to occur in the organs, ice is actively transported from the organs to the large fluid filled spaces limiting the amount of freezing which occurs in the organs. When the organs begin to freeze, there is minimal water content as the majority now resides in the large fluid filled spaces. These spaces are less likely to suffer from ice damage when compared to important organs, which is why the organs shift the water there. The cryoprotectant, glucose, is transported around the body by the blood, but as the periphery begins to freeze, no further glucose can diffuse. However, as glucose is still being produced, the organs still receive glucose i.e. their concentration of glucose rises. As the body begins to freeze totally, the last places to receive glucose are the liver and heart, which means they have the highest concentration of glucose – this is important for the thawing process. When completely frozen, breathing ceases as does the heartbeat however the frog continues its metabolism at a highly reduced rate. This keeps the frog alive and allows it to deal with the anoxic conditions. When the wood frog eventually begins to thaw, it melts from the core to the periphery (the opposite direction to which it froze). This is because the highest concentration of glucose is found in the heart, liver and other organs. As glucose is a colligative defence molecule, at higher concentrations it reduces the freezing point, but it also reduces the melting point. Therefore, the organs with the highest concentration of glucose (liver and heart) have the lowest melting point and thus thaw first. As the frog thaws from inside to out, it must cope with the readjusting volumes of cells and fluid filled spaces due to the ice melting. It must also readjust its metabolism from the reduced anoxic levels to increased normoxic levels. This involves the resumption of breathing and the heartbeat. One final concern is the presence of reactive oxygen species which occur during the thawing process, this requires the use of antioxidant molecules to inhibit oxidation of other molecules by the reactive oxygen species. Diving to depth is a typical behaviour observed in many aquatic mammals such as; whales, otters, seals, walrus and many others. Such mammals are well adapted at diving. The Weddell seal for example, is able to dive for periods of 80 minutes and more. Compare this to the average 1-3 minutes in untrained humans and you can see that diving mammals have developed great abilities for diving to depths. The two major problems associated with diving are; limited oxygen stores (limiting the length of the dive) and hydrostatic pressure (limiting the depth of the dive). Oxygen is an important factor during diving, an absence of oxygen (anoxia) means anaerobic respiration becomes the only source of energy. Anaerobic respiration consists only of glycolysis, which produces around 5% of the energy (ATP) produced during aerobic respiration. Such a great deficit in ATP production can damage brain cells and have fatal consequences. In anaerobic respiration, lactate is produced as a waste product. Normally (in aerobic conditions) the lactate is metabolised by the presence of oxygen, in its absence however, the lactate builds up and dissociates into lactic acid. This causes fatigue, which decreases swimming ability. The dangers of hydrostatic pressure come include; physical damage as a result of the pressure (barotrauma). Especially gas filled spaces of the body such as the lungs and ears. As well as decompression sickness (referred to as ‘the bends’ in humans), caused by rapid changes in pressure. The main stores or oxygen in mammals are; the lungs, blood and muscle. Oxygen is also present dissolved in body tissue. In adept diving mammals such as the Weddell seal the primary store of oxygen is the blood (in haemoglobin), followed by the muscle (in myoglobin) and then the lungs. The Weddell seal actually exhales before performing a dive. Having a large store of oxygen in the lungs causes some problems. A large lung volume can make the dive more energetically costly due to the extra energy spent negating the effect of increased buoyancy. Exhaling pre-dive decreases energy required to dive. Another factor to consider is that, being a gas filled space, the lungs are susceptible to hydrostatic pressure. At large enough depths, the pressure can cause the lungs to collapse. So, a large lung volume is not necessary for accomplished diving mammals and some will exhale before diving to reduce the lung volume further. The blood has an excellent oxygen carrying capacity, oxygen binds with haemoglobin in the blood and this essentially dissolves the gas, thus reducing the volume and associated problems. Adept divers will have a greater volume of blood (and haemoglobin) and therefore are able to store more oxygen. Humans are typically able to store 15ml of oxygen per Kg of body weight, whereas accomplished divers can store anything between 40-70+ ml Kg-1. Myoglobin is similar to haemoglobin, it is found in the muscles and transports oxygen, but it has a much higher affinity for oxygen. Large concentrations of myoglobin mean diving mammals are able to dive for much longer, therefore high levels of myoglobin are associated with accomplished divers. No matter how great the ability to store oxygen, there will always be a time when oxygen stores are exhausted. This is known as the aerobic diving limit. It is the length of time an organism is able to dive and respire aerobically from stored oxygen. Dives longer than the aerobic diving limit are possible, but are often rare even in capable diving mammals. Taking the Weddell seal as an example, 80% of dives occur within the aerobic diving limit (about 18-20 minutes) but some still dive for periods of 80 minutes or more. This shows they have developed systems to help combat the buildup of lactate and the lack of oxygen which occurs during anaerobic dives of 20 minutes or more. The body is still able to produce energy (ATP) without oxygen via glycolysis during anaerobic respiration but this is at an effective efficiency of 5%. Therefore glucose and glycogen stores (the body’s fuel) would be depleted at 20x the normal rate if glycolysis increased to match aerobic ATP production. Such an increase is known as the ‘Pasteur Effect’, but if the diving mammal is able to decrease metabolism, this might not be necessary. Diving mammals are able to undergo metabolic depression, which reduces the energy demand of certain body systems by reducing their output. The only problem is that the mammalian brain is very energy hungry and requires a lot of ATP to remain functional. The ‘Diving Reflex’ is observed when diving past the aerobic diving limit. This reflex includes the slowing of the heart rate (bradycardia) and regional vasoconstriction to produce metabolic depression. The bradycardia seen in the diving reflex, reduces the heart rate from around 60-70 to 5-10 beats per minute. This is combined with regional vasoconstriction to increase the length of dives. The regional vasoconstriction is seen across the body except the brain as it would be unable to survive any reduction in blood flow. The amount by which blood flow is reduced across the rest of the body varies from 80-95%. This essential sets up a near closed blood flow from the lungs, to the heart, to the brain. Blood flow from the heart to the rest of the body is minimal. Bradycardia prevents a change in stroke volume, blood pressure and blood flow, which if altered may damage the body. So even though the dimensions of the cardiovascular system have been reduced, the blood flows around the ‘closed circuit’ of the heart, lungs and brain as it would flow round the complete cardiovascular system under aerobic conditions. The ‘closed circuit’ is able to remain aerobic from oxygen stores in the blood, muscles and lungs. The rest of the body remains aerobic only for as long as the oxygen bound to the myoglobin of the muscles lasts, barely any oxygen is received from the blood or lungs due to the extreme vasoconstriction. This means the rest of the body becomes anaerobic much faster than the ‘closed circuit’, the anaerobic respiration results in production of lactate. Because of this, high levels of lactate are observed in the muscles, whereas levels are low in heart, lung and brain. Lactate produced by anaerobic respiration of the rest of the body is stored in the muscles until resurfacing. Lactate remains in the muscles due to the regional vasoconstriction, which essentially has disconnected them from the blood flow. Upon resurfacing, regional vasoconstriction and bradycardia cease. This results in a ‘Wash out’ of lactate. All the lactate stored in the muscles during the dive is released into the bloodstream, thus increasing blood lactate levels. The lactate is metabolised however, in the presence of oxygen. The lactate produced during the dive must be metabolised before another anaerobic dive may occur. Therefore the longer the dive, the longer it takes before another dive may occur. The period of time between dives spent metabolising lactate, is known as the recovery period. Because of this, long dives are not desirable (unless necessary, such as escaping a predator) as it means less time can be spent beneath the water. To further preserve energy, diving mammals will perform diving locomotion which reduces muscle energy requirements as much as possible. Diving mammals will use a combination of actively stroking for propulsion and gliding to preserve energy. Typically the descent of a dive requires stroking (combined with brief glides) to reach large depths due to buoyancy of the animal. The ascent however consists almost completely of long gliding behaviour in an attempt to expend as little energy as possible. Stroking it is not needed due to buoyancy, which causes the animal to rise to the surface. Another energy saving behaviour is the induction of voluntary hypothermia. Whilst diving, mammals actively seek cooler waters, as a decrease in temperature causes a decrease in metabolic rate. If the animal is able to decrease their metabolic rate, the length of the dive can be extended. Pressure can be measured in terms of atmospheres. At sea level (0m), pressure is the equivalent of 1 atmosphere or 1atm.Underwater, the pressure increases by 1atm per 10 meters, therefore at 10 meters below sea level, the pressure is 2atms. At 100 meters below sea level, the pressure rises to 11atms. Boyle’s law states that pressure multiplied by volume equals a constant value (at a constant temperature) or PV= Constant. This means, if pressure increases, volume decreases (and vice versa). This is important because the body contains many gas filled spaces such as the lungs. Gas is easy to compress, and so as pressure increases (i.e. As we travel deeper into the ocean) the volume of these gas filled spaces within the body decrease in volume. Dalton’s Law – The total pressure of a gas constitutes all of the partial pressures within the gas. For example, the total pressure of air at sea level (or Ptot) = 1atm. This means all partial pressures of gases within air must total to 1atm. PN2 (or the partial pressure of nitrogen) = 0.78atm and PO2 = 0.21atm therefore the partial pressures of all the other gases in air must equal 0.01atm. Henry’s Law – The solubility of a gas in a liquid is proportional to the partial pressure of the gas (above the liquid). This means that if the PN2 in the lungs increases, the amount of nitrogen which dissolves into the blood also increases. The main concerns of hydrostatic pressure are; the toxicity of the gases, decompression sickness and barotrauma. The potential of damage being caused by these factors increases as hydrostatic pressure increases. At certain depths, nitrogen and oxygen can become toxic. At around 20m depth nitrogen can begin to have affect consciousness – altering perception. At around 50m oxygen can cause damage to the central nervous system, lungs and eyes. Barotrauma is physical damage as a result of pressure. Gas filled spaces are prone to such damage. Major targets of barotrauma are the thorax and the trachea, if the trachea is not strengthened at great depths, the high pressure can cause the trachea to collapse. This is similar with the thorax, as pressure increases, the size of the lungs decreases. At a depth of 40m the lungs are 1/5 of their size at sea level. Such a large decrease in size could cause damage to thoracic muscles. By having a strengthened trachea, elastic diaphragm and strong sternum, it is possible to prevent such damage. PN2 (0.8atm) is equilibrated between the lungs blood and tissues. Ptot has increased to 4atms. Due to Dalton’s law, PN2=3.2atms. Due to Boyle’s law, the volume of the lungs has decreased. PN2 in the lungs quickly reaches 3.2atms, due to their compression. PN2 in the blood slowly equilibrates followed by the tissues. Eventually lungs, blood and tissues have all equilibrated to PN2=3.2atms. Resurfacing too quickly means PN2 in the blood and tissues remains at a value near 3.2atms as there was not a chance to equilibrate with the lungs. At the surface, PN2=0.8atms in the lungs, whilst blood and tissues PN2 still equals 3.2atms. This results in a rapid release in pressure resulting in the formation of bubbles in the blood. The bubbles consist of nitrogen at a partial pressure of 0.8atms and so it is energetically favourable for any remaining dissolved nitrogen to diffuse into these bubbles. Because of this, the bubbles can quickly grow in size. Decompression sickness arises due to any rapid change in pressure (not just changes in pressure when diving). It is also known as either ‘Caisson’s Disease’ or the ‘Bends’. The only treatment available is to contain the sufferer in a hyperbaric chamber – a chamber where pressure can be controlled and allowed to rise steadily, preventing further formation of nitrogenous bubbles in the blood. Decompression sickness can arise due to the rapid resurfacing from large depths underwater, this results in a large gradient of partial pressures between the blood, lungs and tissues. The offloading of nitrogen from the blood into the lungs is a relatively slow process and therefore takes time. By resurfacing too fast, the pressure is quickly released causing gases (nitrogen) to go out of solution. This results in the formation of nitrogen bubbles in the blood. The bubbles can join together to become larger and more dangerous, whilst nitrogen is able to diffuse in, further increasing the size. It is energetically favourable for nitrogen to diffuse into the bubbles as they are at normal atmospheric pressure. If decompression sickness reaches the spinal cord, it can result in paralysis. There are basically two ways to combat decompression sickness; limit the load of nitrogen into the body and prevent its distribution. To limit the load of nitrogen, diving mammals have evolved specialised alveoli. An alveolus consists of a sac-like, bulbous area (where gas exchange takes place) and a terminal bronchiole (a tube connecting to the alveolus where no gas exchange takes place). In terrestrial mammals, pressure (such as that experienced whilst diving) causes the bronchiole to collapse, trapping nitrogen within the bulbous end of the alveoli. With nowhere to go, the nitrogen moves out into the tissues and blood (increasing nitrogen load and the possibility of decompression sickness). The bronchioles of diving mammals on the other hand consist of strengthened cartilage, preventing them from collapse. Under pressure it is the alveoli which compresses first. Nitrogen in the alveolus moves out into the bronchiole. As no gas exchange occurs in the bronchiole, nitrogen is not able to move into the surrounding blood and tissues. Nitrogen load is therefore decreased as is the possibility of suffering from decompression sickness upon resurfacing. Such alveolar collapse occurs at a depth of 30m in Weddell seals, meaning the partial pressure of nitrogen in the tissues does not increase further than 3.2atms. The other method of avoiding decompression sickness is to limit the distribution of nitrogen. This is done by peripheral vasoconstriction. As with oxygen limited dives that extend past the aerobic diving limit, regional or peripheral vasoconstriction result in decreased blood flow to the body. Blood flow is only preserved to the lungs, heart and brain. The benefit of this is that fatty tissue (i.e. the areas to where blood flow is restricted) has high nitrogen solubility, so reducing the blood flow to these areas also reduces the amount of nitrogen able to dissolve into the tissue. The brain on the other hand consists mainly of watery tissue which has much lower nitrogen solubility; it also offloads nitrogen much faster and therefore has a reduced risk of bubble growth. Oxygen comprises a large proportion of our atmosphere (21%) and has become a vital gas for many organisms on Earth. Without it our ability to produce energy (as ATP) via aerobic respiration fails. Oxidative phosphorylation, the primary method of aerobic ATP production, produces large amounts of ATP (from our glycogen stores) just as long as we are able to continually supply O2. Without oxygen we resort to anaerobic respiration, where the primary method of ATP production is glycolysis. In comparison to oxidative phosphorylation, the amount of ATP produced is minimal. 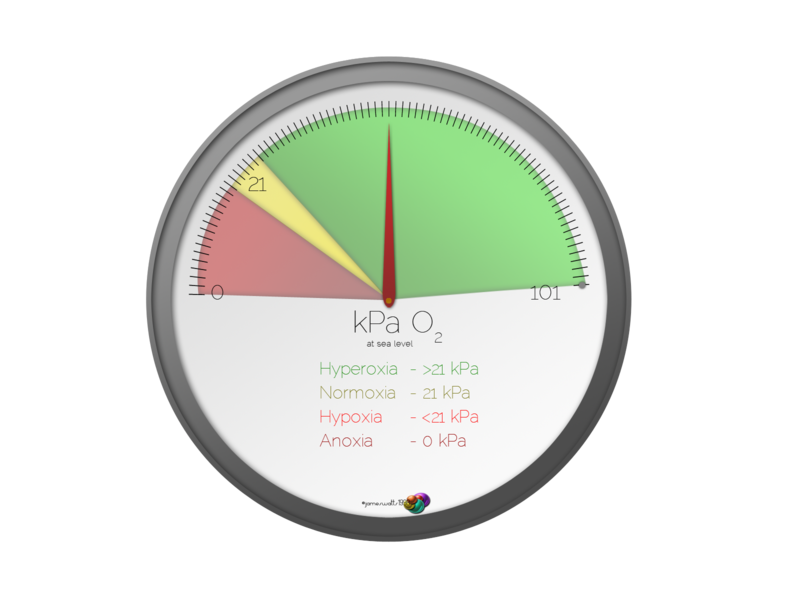 Whilst we take oxygen for granted in our environment, there is a large variety of situations where oxygen levels are limited, or where oxygen is completely absent. Typically, such conditions arise in aquatic environments where the ability of oxygen to diffuse is greatly reduced and oxygen levels depend heavily on the ability of organisms to photosynthesise. Yet many respiring organisms are able to live in these environments due to adaptations to low oxygen/ zero oxygen situations. When referring to the content of oxygen in an environment, we usually state its partial pressure i.e. the proportion of the total gas which comprises oxygen. At sea level, the total pressure of the gases in the environment is 101kPa (or 1 atmosphere), as oxygen makes up 21% of these gases, the partial pressure of oxygen at sea level is 21kPa. The major role of oxygen is to provide the body with metabolic energy in the form of ATP. This is done during aerobic respiration via a process known as oxidative phosphorylation which occurs within the inner mitochondrial membranes. The role of oxygen in this process is to act as a terminal electron acceptor. The transfer of electrons to oxygen provides enough energy to phosphorylate ADP to ATP. Glycolysis – Glucose is metabolised into 2 molecules of pyruvate (a 3-carbon molecule). This provides a small amount of ATP as well (2 per glucose molecule). Pyruvate is metabolised into 2 molecules of Acetyl CoA (a 2-carbon molecule). One molecule of carbon is lost as CO2. The Krebs cycle – Each molecule of acetyl CoA undergoes a number of enzyme-catalysed reactions producing a number of highly energised electrons. These electrons are used in the electron transport chain to produce vast amounts of ATP. The efficiency of ATP production drops to around 5% during anaerobic reproduction. One way the body can cope with this is to increase the glycolytic rate (the rate of glycolysis). Increasing the glycolytic rate by about 20x returns the level of ATP production to that seen in aerobic respiration. This is known as the Pasteur Effect. Increasing the glycolytic rate causes a rapid drop in the body’s store of glycogen. Without glycogen, the body will be unable to perform any form or respiration – anaerobic or not, which will inevitably lead to death. The Krebs cycle stops soon after oxygen becomes absent. This means there is no demand for acetyl CoA. The result of this is excess production of pyruvate. Lactate dehydrogenase converts the excess pyruvate to lactate (and also recycles NADH + H+ to NAD+ allowing glycolysis to continue). A build up of lactate is also undesirable however as it immediately dissociates into lactic acid. The low pH of lactic acid will begin to reduce cellular pH and denature sensitive enzymes. As a result of decreased pH and ATP, maintaining the membrane potential becomes very difficult. The Na/K ATPase pump which actively removes N+ from the cell and uptakes K+ in order to maintain the correct (-70mV) membrane gradient, stops functioning when ATP production diminishes. The maintained -70mV gradient begins to equilibrate at 0mV, causing a breakdown of the transmembrane gradient within a matter of minutes. This has dire consequences on the mammalian brain in particular; the change in the membrane potential allows calcium ions to enter the cell. Intracellular calcium causes cell damage and hastens enzyme breakdown. 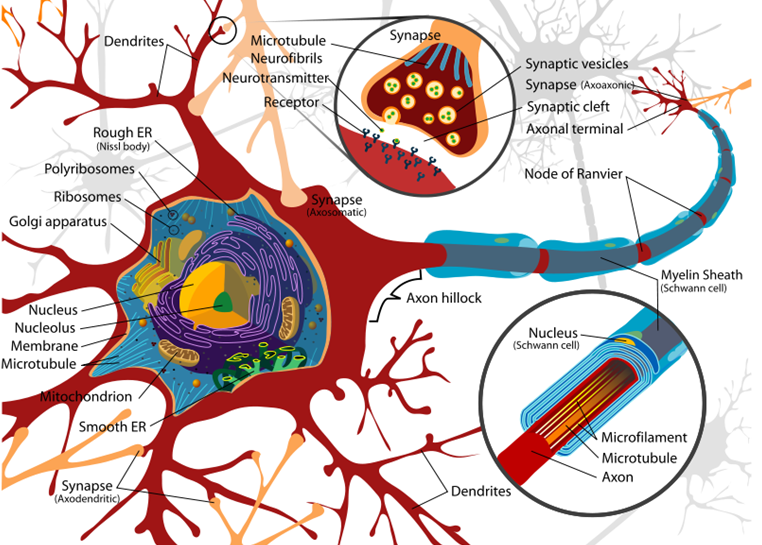 The breakdown of these important brain cells causes permanent brain damage and if not supplied with oxygen quickly enough, will lead to death. To survive anoxic conditions, an organism must be able to deal with the problems associated with anaerobic respiration; keeping up ATP levels (particularly in the brain) and avoiding acidification and associated cellular damage. Two organisms which are highly adapted to surviving anoxic conditions are; the crucian carp and the painted turtle. Both have different strategies for maintaining the body without oxygen, but both do so by combating the associated problems with anaerobic respiration. One of the problems with anaerobic respiration is that, after a short time in anoxia, glycogen levels decrease rapidly. The Pasteur effect (where glycolytic rate increases for a short period to accommodate the lack of ATP production from oxidative phosphorylation) is only temporary. All body stores of glycogen are quickly depleted and the body is no longer able to survive. The crucian carp (and to a smaller extent the painted turtle) has an unusually large glycogen reserve in the liver (30% of the total liver mass). Such large stores of glycogen allow the crucian carp to survive in anoxia by glycolysis alone for a much longer period of time. The crucian carp will typically only face anoxic conditions during the winter months, when a thick layer of ice forms over the water sources they inhabit. Because of this, the crucian carp has adapted to build up glycogen stores throughout the year so that come winter, the glycogen stores are as great as possible. To do this, during the warmer summer months, instead of using carbohydrates for energy (i.e. Glucose / glycogen) lipids are used, allowing the crucian carp to build glycogen stores. Although increased glycogen stores length the period of time the crucian carp is able to survive in anoxic conditions, it is not the only factor which prolongs this survival period. Metabolic depression means slowing down the rate at which the body consumes ATP, so combining reduced ATP requirements with greater stores of glycogen to produce ATP ensures a near maximum survival time in anoxia. To reduce metabolic rate, locomotion is reduced during anoxia this means muscles use as little energy as possible. Also, some sensory functions are suppressed, these include vision and hearing. During the winter months when anoxic conditions arise, the thick layer of ice above reduces light levels to a minimum so vision is not a necessity. Crucian carp will also induce voluntary hypothermia during anoxia. This is actually beneficial to the carp because at lower temperatures, metabolic rate decreases. Therefore when anoxic conditions arise, the crucian carp will swim to cooler waters to reduce their metabolism. The problem with glycolysis is the production of lactate and hence lactic acid, causing a decrease in cellular pH and thus acidification. If the crucian carp is producing ATP from glycolysis alone then cellular concentrations of lactic acid would normally quickly rise and pose a major threat for the carp. However, instead of producing lactate as the end product of glycolysis, the crucian carp has adapted to produce ethanol. By producing ethanol instead of lactate, the crucial carp benefits in a number of ways. Primarily ethanol is non-acidic and thus will not decrease intracellular pH (therefore avoiding the associated damage to the cell as a result of acidification). Ethanol is also lipid soluble meaning it will not build up in the body as it is easily excreted across the gills. Normally, during glycolysis, pyruvate is metabolised to acetyl CoA by pyruvate dehydrogenase – producing lactate as the end product. Yet a mutation in the pyruvate dehydrogenase enzyme of the crucian carp means that instead of acetyl CoA, acetaldehyde is produced. Acetaldehyde is then metabolised by alcohol dehydrogenase to produce ethanol. However, the brain is unable to produce ethanol in this manner, only skeletal muscle can. Any glycolysis occurring in the brain will therefore produce lactate as the end product. This lactate however, is transported via the blood, to the skeletal muscle. Here, the lactate is turned into pyruvate where glycolysis will metabolise it into ethanol, it is subsequently excreted across the gills. The painted turtle deals with anoxia in a different way to the crucian carp. Whereas the crucian carp has very large glycogen stores and avoids acidification by producing ethanol, the painted turtle favours metabolic depression. Although the crucian carp also depresses its metabolism, it is on a much smaller scale. The crucian carp is still aware and the brain functions as normal. The painted turtle on the other hand becomes almost ‘comatose’ as many more body systems are shut down. The painted turtle must too deal with the excess of lactate produced during glycolysis to avoid acidification. The painted turtle produced lactate as the end product of glycolysis and does not have the ability to form ethanol from pyruvate. To avoid acidification, it must therefore buffer the low pH of the lactic acid. To buffer the lactic acid, the painted turtle uses bicarbonate and carbonate. The turtle has large stores of these in its shell (which has a rich blood and nerve supply). The carbonates are able to ‘mop up’ excess H ions (which make the blood acidic) and through a number of reactions, the carbonate and H ions and turned into carbon dioxide and water. The shell is also a rich store of calcium ions. These calcium ions are able to bind with lactate and the resulting molecule becomes stored in the shell until it is possible to excrete the lactate during aerobic respiration. This method of avoiding acidification is arguably not as efficient as the crucian carp (producing non-acidic ethanol) but it does help the turtle to avoid acidification for a much longer period of time than would normally be possible. The painted turtle is able to survive anoxia for such extended periods of time due to the amazing amount at which it is able to decrease its metabolic rate by (90-95%). All non-essential systems are shut down which causes the turtle to become ‘comatose’ as the brain becomes quiescent. Even essential systems such as protein synthesis cut their ATP demand drastically. However on system reduces its ATP demand as little as possible -the Na/ K ATPase pump. As we know, if the Na/ K ATPase pump stops functioning, then the transmembrane gradient breaks down due to the leakage of Na & K ions across the membrane. This allows calcium ions to enter the cell and cause fatal destruction if normoxic conditions are not resumed. However, the painted turtle is not able to maintain 100% efficiency of this pump during anoxia due to the large demand of ATP it requires. Its efficiency is essential cut down to 25%. To combat the reduction in the ATPase pump’s efficiency a phenomenon known as ‘Channel Arrest’ occurs. This allows the retention of the transmembrane gradient. Normally Na & K are able to leak into and out of a cell via transmembrane ion channels, down their respective concentration gradients. However during channel arrest these ion channels are forced to close greatly decreasing the amount of ion leakage into and out of the cell. This essentially counteracts the 4-fold reduction in the ATPase pump’s efficiency and allows for the preservation of the transmembrane gradient – thus preventing cell damage. Another phenomenon of the painted turtle which allows for further depression of the metabolic rate is ‘Spike arrest’. This inactivates Na & K ion channels normally associated with producing action potentials. 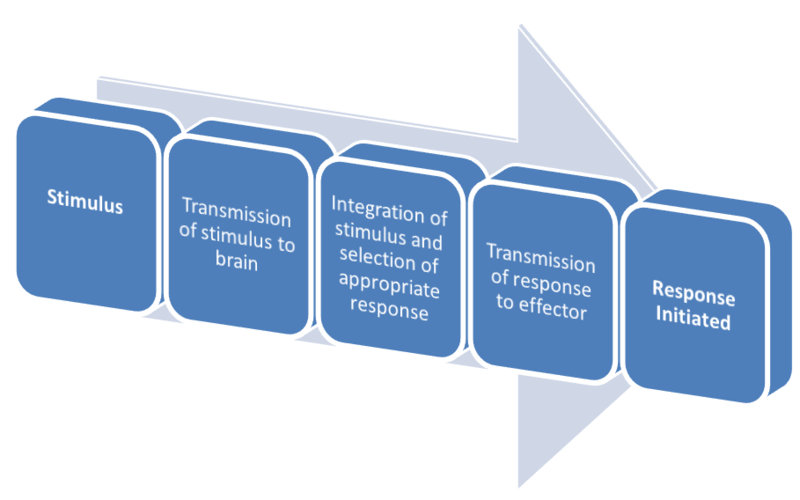 However as these channels are inactivated the action potential threshold becomes greatly elevated – thus forcing the brain into a quiescent state and preventing responses to stimuli. Certain molecules are involved with mediating the transition to an anoxic state. The main ones are the neurotransmitters; glutamate and GABA as well as the metabolite adenosine. Adenosine release is associated with low levels of oxygen. When low blood oxygen is detected, adenosine is released shortly after. The immediate result is an increase of cerebral blood flow. This decreases soon after in the painted turtle as the metabolic rate is lowered – however as the crucian carp remains ‘active’ during anoxia, cerebral blood flow does not reduce. Adenosine is basically responsible for ensuring ATP production is able to meet demand as it is responsible for a number of factors contributing to the metabolic depression associated with anoxia. It blocks the production of glutamate (an excitatory neurotransmitter) and has been found to suppress protein synthesis and down-regulate NDMA receptor activity. The NDMA receptor is highly permeable to Ca2+ ions, which are responsible for cell damage in anoxic conditions of unspecialized organisms. Normally in anoxic conditions excessive glutamate over-stimulates this receptor and causes a massive influx of calcium ions into the cell. Therefore the ability of adenosine to down regulate this receptor is highly beneficial during anoxia. GABA and glutamate are highly related neurotransmitters; GABA is an inhibitory neurotransmitter and glutamate an excitatory neurotransmitter. During anoxia, we see a steady rise in GABA and a steady decline in glutamate. An initial steep rise of GABA in the painted turtle is due to increased levels of adenosine (released at low blood oxygen levels). Because GABA is an inhibitory neurotransmitter it is able to effectively reduce the amount of ATP the body requires, as the painted turtle reduces its metabolism by 90-95% we see very large amounts of GABA released. Release of GABA is seen in the crucian carp too, but as the carp remains active, GABA levels observed are much more modest. Effectively we see two different strategies for combating anoxic conditions. The painted turtle, although it has larger glycogen stores than other animals, chooses to reduce its metabolism by such a large amount that it becomes almost comatose. This is achieved by Spike arrest, channel arrest, nearly a total suppression of nervous activity and a huge increase in extracellular inhibitory neurotransmitter, GABA. The limiting factor of how long the painted turtle can remain in anoxia is therefore the build-up of lactate. Although it is steadily removed and stored in the shell, it eventually builds up enough to reduce cellular pH to fatal levels if normoxic conditions are not returned. The crucian carp on the other hand has glycogen stores so large it is able to survive on glycolysis alone at a metabolic rate not too far below normal. In terms of metabolic depression the crucian carp only moderately suppresses nervous activity, coupled with moderate release of GABA and suppression of locomotor activity (as well as voluntary hypothermia to decrease metabolic rate further). The key strategy for survival is the production of the non-acidic glycolytic end product – ethanol, thus preventing cellular pH from falling to fatal levels. Because of this, the limiting factor of anoxia survival in crucian carp is therefore the amount of glycogen stored in the liver.